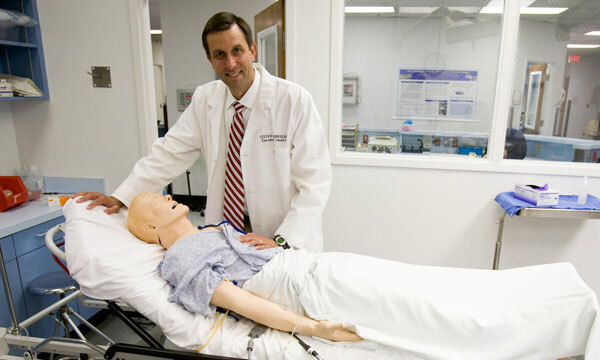 A University of Florida College of Medicine – Jacksonville faculty physician has received national recognition for his contributions to simulation-based training in emergency medicine. Steven “Andy” Godwin, MD, FACEP, a UF COMJ professor and chair of emergency medicine, and assistant dean for simulation education, was named the 2017 Distinguished Educator in Simulation by the Simulation Academy of the Society for Academic Emergency Medicine. The award was presented May 19, 2017, during their annual Simulation Academy Awards. Simulation education saves lives and provides residents with a bridge between the classroom and the emergency room. Godwin began incorporating simulation training into the UF COMJ emergency medicine residency curriculum in 2000 to provide a structured setting for the deliberate practice of clinical skills. The training also provides self-reflection for students, and the opportunity for appropriate and timely supervisor feedback. Increased use eventually led to the creation of the UF Center for Simulation Education and Safety Research, or CSESaR — a 24,000 square foot facility located at UF Health Jacksonville that is supported by both the hospital and the University of Florida. Godwin is also one of the creators of the simulation team competition known as SimWars that has been highlighted at national emergency medicine meetings and the International Meeting on Simulation on Healthcare. The competition allows residents to take part in a mock trauma scenario that they do not know is coming to provide them with a taste of the split-second decisions made regularly in an emergency room that could mean the difference between life and death for a patient. Godwin received his medical degree from the Medical University of South Carolina. He completed emergency medicine residency training at the UF College of Medicine – Jacksonville. In addition to simulation education, Godwin is a nationally recognized expert in emergency airway management and teaches across the country educating physicians, paramedics and advanced level practitioners. Godwin is a member of the Clinical Policies Committee of the American College of Emergency Physicians, most recently acting as chair and co-chair for their policies on procedural sedation and asymptomatic hypertension in the emergency department. In addition to being a member of the editorial board for Emergency Medicine Practice, he has authored and co-authored numerous publications, including resources on pediatric and adult procedural sedation and airway management.